You can now order high fashion for breakfast.Just when you think you’d seen it all, fashion is here to surprise you one more time. 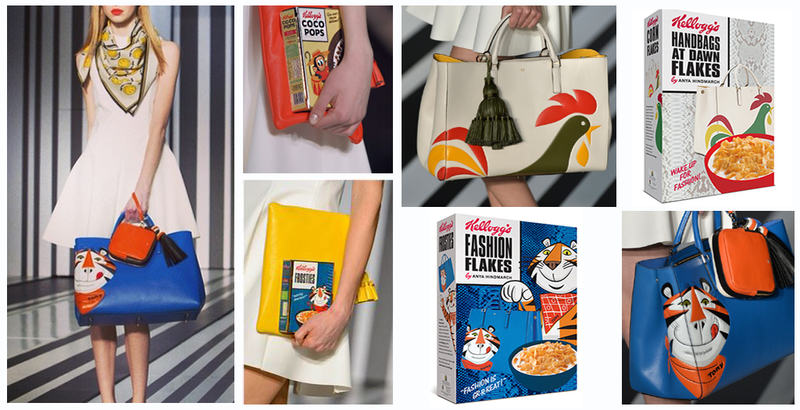 Anya Hindmarch, an English accessories designer, decided to treat Paris her own way by designing the limited edition of KELLOGG’S cereal for the Paris fashion week in September. So the Fashion Flakes come with Tony the Tiger box with a quote ’Fashion is gr-r-reat’. They are on sale now in Anya Hindmarch store in Paris and Waitrose chain stores in Britain. The inspiration behind this design were nostalgic supermarkets, the childhood memories and business as apparently Tony the Tiger leather bag was one of her best-sellers. It does not surprise me at all as the internet is full of food inspired accessories and some parts of clothing.The positive and funny approach to fashion became a very strong trend thanks to the world class designers such as Jeremy Scott for Moschino and Karl Lagerfeld for Chanel. The idea of getting a piece of high fashion for cheap and eat it for breakfast is meant to make people laugh, not to consider that as another way to just make money. This is probably one of the most affordable designer items ever made as you can get the box for just around 4 euros. The cereal fashion goes further than that. The first cereal bar is going to be open in London’s Hackney/Dalston area on the 10th of December. People are going to be able to order their fav cereals with any type of milk as they are aiming to provide all kinds of them. I put that on my ‘to-do-before-I-die’ list already. I also spotted loads of ‘KALE’ t-shirts on the streets of east London so I am expecting kale-shaped bags and accessories next season. Healthy foods combined with fashion is getting bigger and bigger.